Since I departed from Facebook and Twitter, my posting needs have grown! Hello! Tell me things of your world! Wow, when trying to find a good picture for this section, I discovered that there is a suite of business services to exorcise computer demons. So just for the record, I don’t mean that kind, I mean the metaphorical kind. Avoid password overlap. If you use the same or similar passwords for multiple sites, then when one gets compromised, the hackers will be able to quickly check other sites to see if you had the same password and steal your identity or money. Use 2-factor authorization. Although it is a bit of a pain, 2-factor authorization makes things much much safer! Don’t email sensitive information. Would you write your SSN on a postcard? No. Because anyone could see it. Email is similar, don’t email around your passwords and don’t email around other sensitive information. Tell it to people on the phone, or through encrypted messaging services. They can support your one-off computer or provide ongoing remote maintenance for businesses with multiple machines. AND they are permaculture renaissance men and treat the Earth extremely well. Dreamy to support that kind of business, right?! I love supporting creative folks. You do you!! Happy Recent Birthday to Bae. 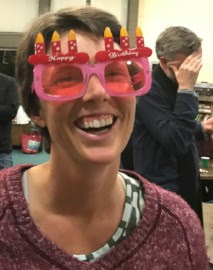 The cringing guy in the background was TOTAL COINCIDENCE at the birthday fete, not at all him feeling ashamed to be seen with me in those fabglasses!